Naperville Illinois IRS Tax Lawyer: Small Business Tax Tips! 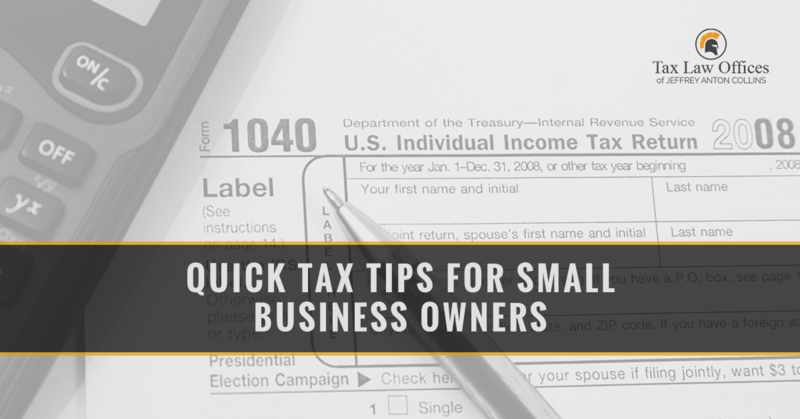 Quick Tax Tips for Small-Business Owners! When it comes time to file taxes for your small business, you probably already know the basics. However, how can you make the most of this tax season and your tax returns? You probably know the simple tips, like keeping every receipt. They can add up to quite a few deductions! Also, keep track of everything in a log that you can consult when tax season comes. The health care tax credit is offered on a sliding scale. This means that businesses that have fewer than 10 full-time employees with wages under $25,000 per person will benefit the most from this. If your business needs to claim this credit, use Form 8941 to calculate your eligibility. If you know that your business did not owe taxes that year, you might be able to carry the credit forward. You can claim business expenses against any remainder of the tax premium if you have one. This does not include land, investment property, and land that is located outside the U.S., buildings that provide lodging, and buildings that store air conditioners or heating units. If you are like other small businesses, you may have made some charitable contributions throughout the year. If so, you can deduct the amount you donated! However, there is a way to maximize this deduction. You can donate appreciable stocks instead of money. That means that your business will be able to deduct the value of the stock at the time of contributing instead of how much you paid for it. For example, if you donate one share of stock that you bought last year for $50 per share, and that stock is now worth $150 per share, you can deduct $150 at tax time. This will give you the deduction you paid, as well as an additional $100 that the share appreciated. Your business means a lot to you, and we understand. If you are hoping to maximize your tax returns during tax season, we understand. Just make sure you do so fairly and legally! If you find yourself in a situation with the IRS, it’s time to contact Tax Law Offices. We proudly serve residents of Naperville and the surrounding areas as they work through any issues they might have with their taxes. Contact our office! We look forward to helping you work towards the best possible outcome for your situation, whatever it may be. For a free consultation, reach out now.